Associated Bank of Green Bay, Wisconsin, positions itself as the place to go for “banking without the runaround.” One need only take a look at their Facebook page to find evidence that this financial institution is honoring that commitment. 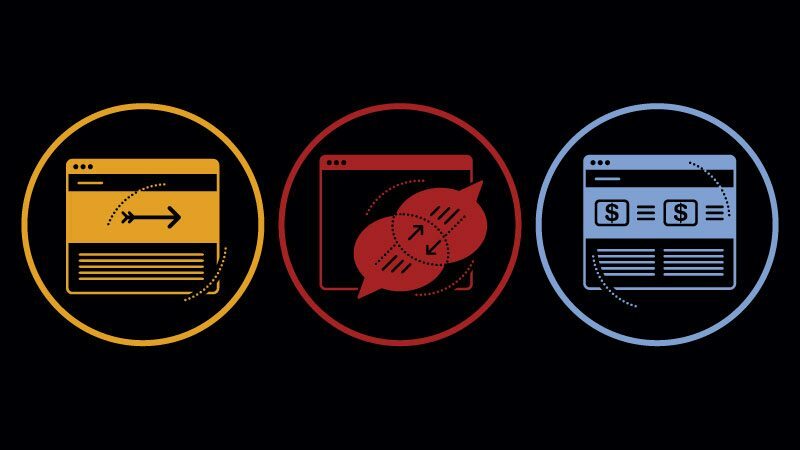 In a time when customers can switch from out-of-touch banks with ease, Associated Bank tries to reach (and retain) its customers through authentic and ongoing interaction. Other brands can learn from this bank’s social media practice. Check out these tips for engaging existing customers and attracting new ones. Associated Bank knows its customers in Wisconsin, Illinois and Minnesota love sports. So instead of directly promoting their checking accounts for the hometown Green Bay Packers or the Milwaukee Brewers, the bank engages its customers’ affinity for competition with contests. During the 2014–15 NFL season, the bank sponsored a three-state football-themed scavenger hunt for customers called the Winning Wallets Contest. Participants used clues from the bank’s Facebook page to find one of three football stars’ “lost wallets.” The 300 winners were awarded with a chance to meet one of the participating legends—current Packers quarterback Aaron Rodgers, retired Chicago Bear Dan Hampton and former Minnesota Viking Randall McDaniel. The bank posted photos of the Winning Wallets contestants on its Facebook page, giving them a chance to bask in their victory, and like or share as they pleased. The bank also donated $100 to the United Way on behalf of each of the winners for an overall contribution of $30,000. “We’re in an area where people are pretty proud of those sports affiliations so we lean on that pretty heavily and we have products that back that up,” said Lindsay Segersin, Associated Bank’s senior digital marketing specialist. Before Segersin joined the team in fall 2013, Associated Banks’ social media outlets were mostly used to post press releases. But contests like Winning Wallets engage the audience much more because they speak their language: sports. On Sept. 1, 2014, the Facebook page had 5,960 likes, Segersin said. It doubled to 12,331 by Jan. 12, 2015, the end of the Packers’ season. 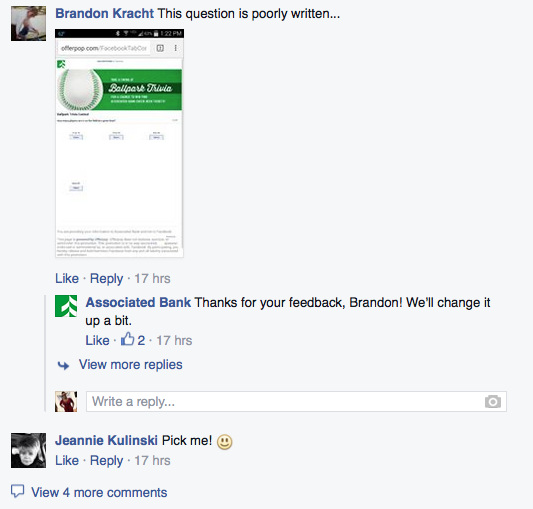 Associated Bank uses its Facebook account as a two-way street for communication. Bank staff not only promotes contests and products, but they also answer customers’ questions quickly and openly. For example, some customers took issue with a recent Facebook contest about baseball trivia. Some complained that a question was written poorly or that they were unsatisfied with the results. The Facebook manager quickly responded to them. One contestant accidentally marked the wrong answer for one question, so Associated Bank entered him in the contest anyway. And the bank changed the wording of one question to improve the quiz for the participants. If their staff is this attentive on Facebook, then imagine how they are when you visit the bank in-person. Segersin said she and the 24/7 customer-care representatives also use their Twitter page to handle complaints and answer questions. In a 2015 Elite Daily study of Millennials ages 18 to 35, six out of 10 Millennials (62 percent) say they are more likely to be loyal to a brand that engages with them on social networks. Associated Bank is on to something here. “We try to be very open to people,” she said. 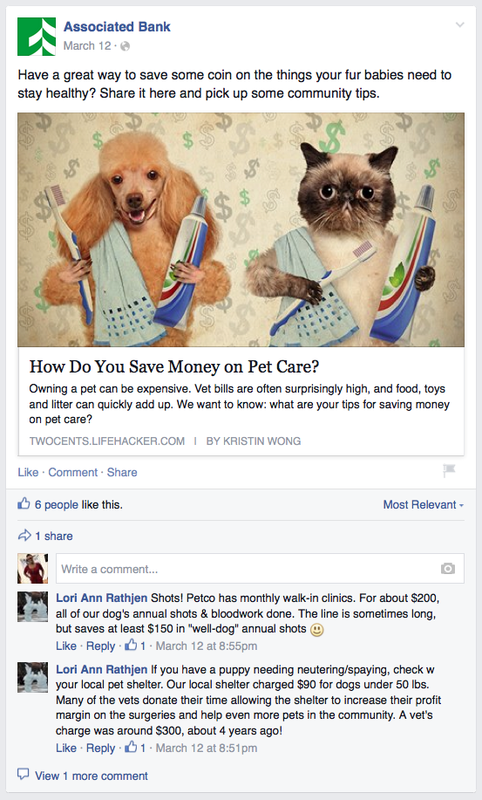 “We try to respond to every comment on the page, whether it’s negative or positive. We want people to know we’re there for them… We’re not hiding behind a brick wall. Maybe some people think banks are stuffy. That’s really not how we are. Associated Bank constantly features the friendly faces of its customers, making them the center of attention—not the bank. 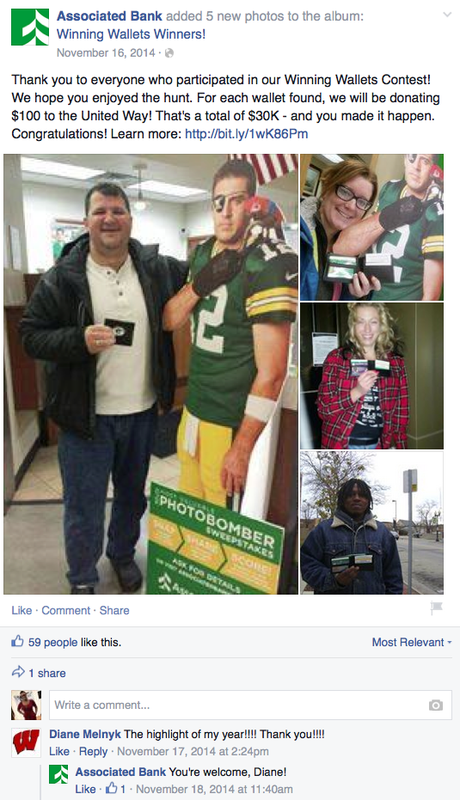 Throughout the football season, the bank asked customers to create and share images in which they’re photo-bombed by NFL MVP Aaron Rodgers. In this case, Rodgers was not only the Most Valuable Player, but also the “Most Valuable Photobomber.” The quarterback is well known for surprising people who are snapping pics. The contestants got creative. They depicted Rodgers diving under water and doing the “YMCA” dance. 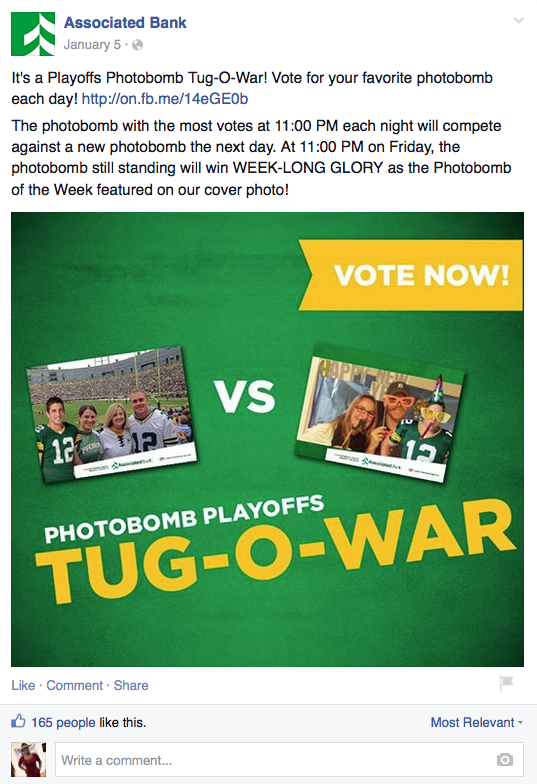 Those photos were entered in the Playoffs Photobomb Tug-O-War where fans voted for their favorites. Every Friday, the most popular photobomb was featured as the Photobomb of the Week in Associated Bank’s cover photo. 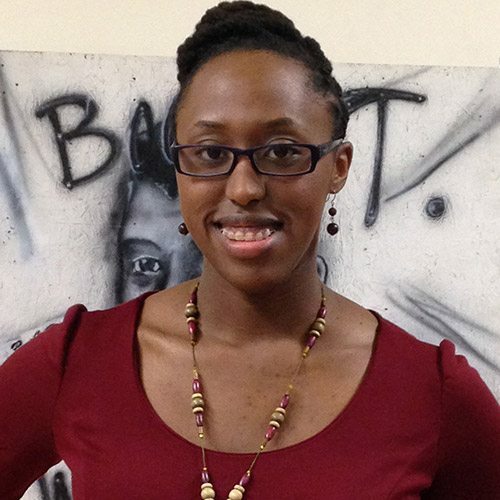 The bank received hundreds of entries, so it put that user-generated content to good use. Associated Bank assembled a collage of about 1,700 photobombs to celebrate Rodgers and created a limited-edition poster that fans could pick up at the bank for free. 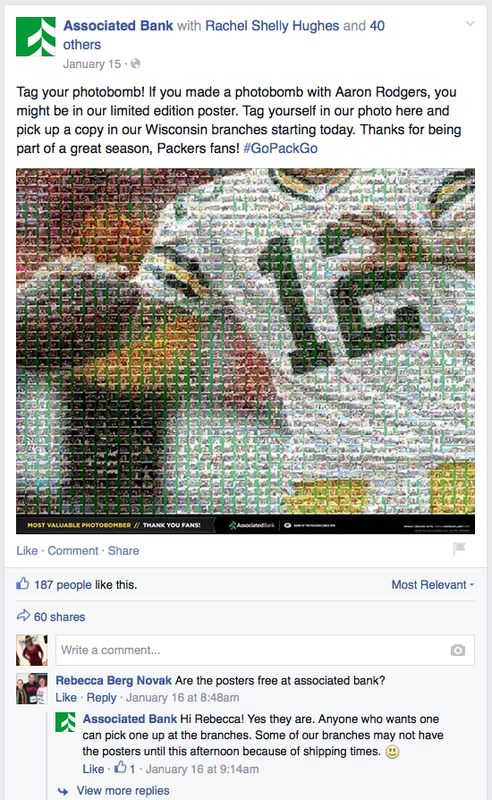 Packers fans could also tag their photobomb in the collage on Facebook. Brilliant! Segersin said the Associated Bank employees had as much fun with the promotion as the customers did. A 2014 Redshift Research survey found that 55 percent of people say they would trust a financial institution more if they received helpful, unbiased content from them. Associated Bank’s Facebook page is also a learning resource for its followers. Some posts link to third-party financial websites and blogs that offer tips for creating a budget, preparing taxes and even how to save on pet care. The content helps customers make informed decisions, gives customers a chance to help each other and helps sell the bank’s services without pushing products. Associated Bank has turned its social media presence around and, in turn, changed the perception of the institution. It’s not “stuffy.” It’s fun. It’s engaging. It’s helpful. 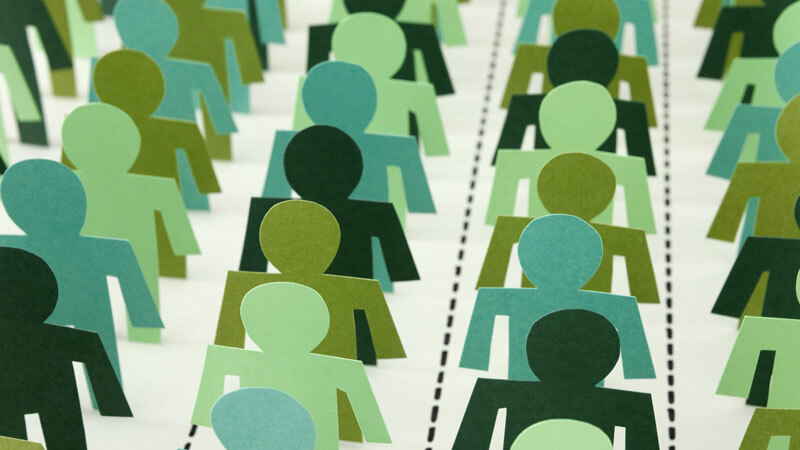 By offering contests, being transparent and catering to the audience’s interests, big brands and small companies, banks and other institutions, can follow this Wisconsin bank’s lead and engage customers on a new level. How is your bank reaching out to you? 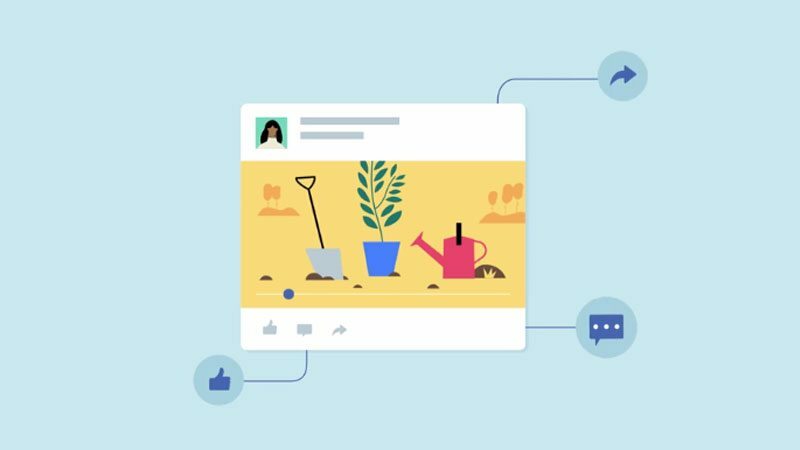 Is a company you regularly do business with using social media in a unique way to engage its audience? Let us know.